January 2010 - Deb Arnold, Ink. Industry Awards: A Value Chain? Who manufactures the award seals for FORTUNE’s 100 Best Companies to Work For – the ones Continental sticks on their planes? Now, why would I want to know that? Beyond generally being fascinated by the genesis of things, complete with theoretical re-enactments of the board room debates (“Don’t you think creating seals for our planes is taking things a bit too far?” “Actually, I think winning an award this big and not putting it smack in front of every single customer would be taking things too far.”), those seals represent a value creation chain of sorts that I find intriguing. A publication decides to create an award. They hire staff to develop and manage the award program. Marketers develop a brand; they put graphic designers to work on a logo. Programmers develop an online submission mechanism. PR professionals are engaged to promote the poop out of it. Companies vying for a spot on the list get their PR/HR teams in gear, possibly hiring and/or outsourcing the project fully or in part: more jobs created. Then regular folks and leadership at the candidate company are enlisted to collect, process, analyze and/or write about facts, figures, outcomes. That’s a lot of work hours devoted to something that won’t earn the company a penny. We’ll never know. If you’re reading this blog then you likely already know (perhaps far too well) that the value of winning an industry award can’t be measured – precisely, scientifically, perhaps even at all. But you know the value is there. And so do the people who manufacture the award seals for Continental. Stay tuned for more in a future post. December 31. There I was, doing year-end bookkeeping (what, is there another time to do it?). I realized it was time to cancel my shmancy monthly plan on Box.net, the nifty online file storage and sharing site. I had needed password protection for a project that had ended, so I could go back to the free plan. Except I had forgotten that Box.net makes you prepay, and that the upcoming month had kicked in a few days before. I was reminded of this by a nasty phone rep. And that’s all I’m gonna say about her. Surely she was not going to refund the prorated amount of my all-but-unused monthly fee ($19.95), no matter how sweetly or logically I argued my case. Her supervisor, I was told, did not take calls, so I’d have to pursue it via a form on their Web site. To make a long story short, he was similarly unmovable and unpleasant. So I turned to that most modern of customer support channels. I went to the Box.net Twitter page and tweeted that I’d just had a terrible customer service experience. No more than 20 minutes later, there was an e-mail in my Inbox from the Box.net Director of Support asking if there was anything he could do to help. I explained the situation. Shortly after, I received an e-mail from Mr. Nas T. Supervisor, profusely apologizing for my negative experience and explaining that of course they would make an exception and refund the entire month. First, let me apologize for this entire support experience. Second, I have spoken to our Billing department and we will be issuing a refund. While it is normally true that we don’t officially give refunds for monthly charges, we also do look at these things on a case by case basis. That said, it is never ok to be treated rudely in any event. I am sorry for your experience and will speak to the rep in question to make sure this kind of thing does not happen again. I know it does not undo anything, but I am also sending along an Amazon gift card via email. Please let me know if I can help in any other way. And indeed, a $25 Amazon.com gift card* immediately appeared in my Inbox. Now that’s something you don’t see every day. Unnecessary? Certainly. Over the top? Probably. But he sure did make it clear that they value my business. And will go to great lengths to keep folks from posting negative reviews on Box.net’s Twitter page. He’s not alone. A friend recently told me that her Zappos shoe order hadn’t arrived as quickly as she’d thought (though was in no way late). Her husband Tweeted about it, and a few hours later Zappos had not only comp’d her that pair but sent her another pair for good measure. All this effective but expensive good will can’t last, or can it? 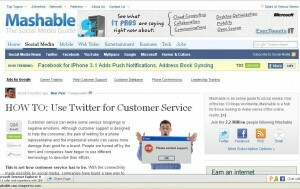 With blogs like Mashable publishing how-to articles on using Twitter for customer service (nb: no mention of free stuff but plenty on the monitoring tools that give Mr. Supportive virtual eyes in the back of his head), we may be in for yet more pleasant surprises about the power of the consumer. Got a similar tale to tell? Do tell. * I used the gift certificate to buy Andrew McAfee’s Enterprise 2.0 (which you should run, not walk to your computer to order), then donated $25 to a local emergency food bank to get things back in karmic balance.